Dear Young Cook—one day you’ll be a chef and you’ll manage the kitchen for a restaurant, a hotel, and more…so it’s a good idea to internalize the idea already that one of the best things for a chef is to connect with or work alongside a professional restaurateur, whether you’re at a restaurant or in a hotel and do not let your ego interfere. Why? A chef sees and dreams of dishes , creations and who knows what else … the restaurateur sees the practical side of things and understands the public and restaurants needs. In this case, the restaurateur is Ron Biala, with whom I worked alongside for a number of months while he managed Trattoria Haba and over all know very well for many years. our place is a modern brasserie were along side great meals we sell also over the counter great bread made by our very own baker , Inon Haba. The thought of the restaurateur: “I have an excellent baguette (and the public loves bread), and I have many different types of good cheese that are in my kitchen and that are used for cooking , garnishing etc,,. My goal: to promote the baguette, to create a constant movement of raw material and…to create an additional dish of great value that requires very little work and uses ingredients that are ready to use . 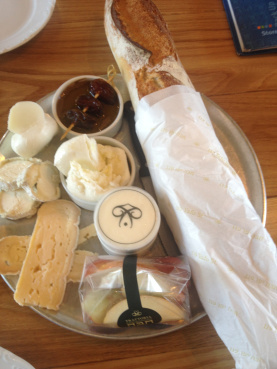 ” The result is an impressive tray composed of items that accompany the baguette, which is easy to sell, looks amazing, and for which there is real profit. for the chef: another item on is menu that makes it attractive, and no extra work or effort to deliver it. For the observer looking on from the side, there is a plate of great cheeses, a wonderful warm baguette and in other words a great comforting treat. And For the professional restaurateur, there is a dish that is easy to prepare and that the public connects with, pays for happily; along the way, the baguette is promoted, and raw material is properly utilized—and that is the correct way of thinking. This entry was posted in restaurant, restaurant management, Uncategorized and tagged chefmichaelkatz, restaurant management, tips for young chefs. Bookmark the permalink.